San Diego Film Festival brings big stars. SAN DIEGO (KGTV) - The second night of the San Diego Film Festival brought in big stars, who talked productions, current culture and how much they love our city. On the red carpet, it was like a reunion, stars giving each other accolades and exchanging greetings. Alex Wolff grabbing a moment of Kathryn Hahn 's time in front of our camera, "I just want to say how amazing you are in your new movie and you're amazing and I'm a big fan and I'll stop." Hahn responding humbly, telling him she's excited to see his work as well. "I've gotten very lucky, these people are actually talented," Topher Grace said. Most people know him for his role as Eric Forman on That 70's Show. Hahn told us she spent the day at the zoo with her daughter, "I love it here!" John Cho telling us he's been here mostly for Comic Con. 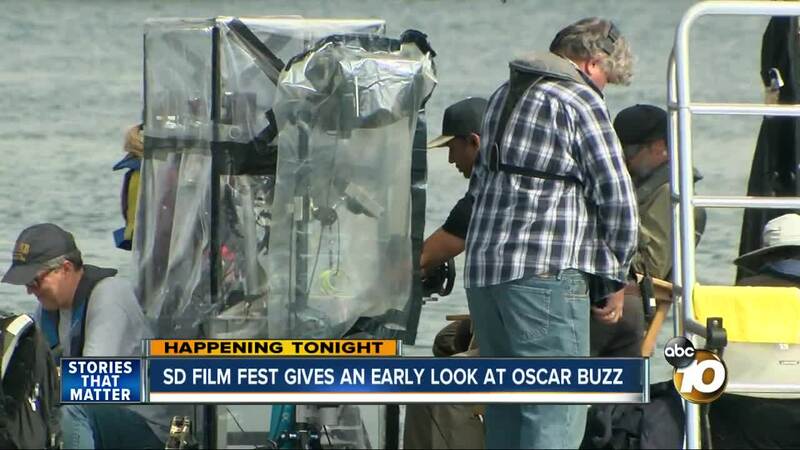 He noted the Trolley 'cuts through the fun' of the event, joking, "just a bunch of people with masks on with impaired vision crossing railroad tracks, not a big deal San Diego City Council, get it fixed." We asked Kenny Loggins about Top Gun 2, and if he'll write a song to rival "Danger Zone", "I'm not officially working on it, I'm working on it on my own end." He said when he's done, he'll put in a bid, "they're still thinking about it." The stars did get serious, talking on hot topics their productions handled. "I think you know with what's going on in our country and our political discourse, we have to stop speaking to each other as much through these devices and to speak with each other eyeball to eyeball and I think that's the way toward peace versus avariciousness," John Cho said, talking about " Searching ". Christian Navarro said he's felt the impact of 13 Reasons Why. "I've traveled the world now for this show and I cannot tell you how many young people have come up to us and said because of your show people have treated me better, because of your show I am still here today." OCtober 10th- 14th is focused on film debuts, some already getting Oscar Buzz. CEO of the San Diego Film Foundation, Tonya Mantooth, gave us her predictions, "I mean I think Jake Gyllenhaal's performance in Wild Life will get him a nomination. I think Melissa McCarthy last night she will get a nomination"
The festival runs through Sunday , you can check out the movies before they hit theaters by buying a pass online.